basil | This Girl’s Gotta Eat! 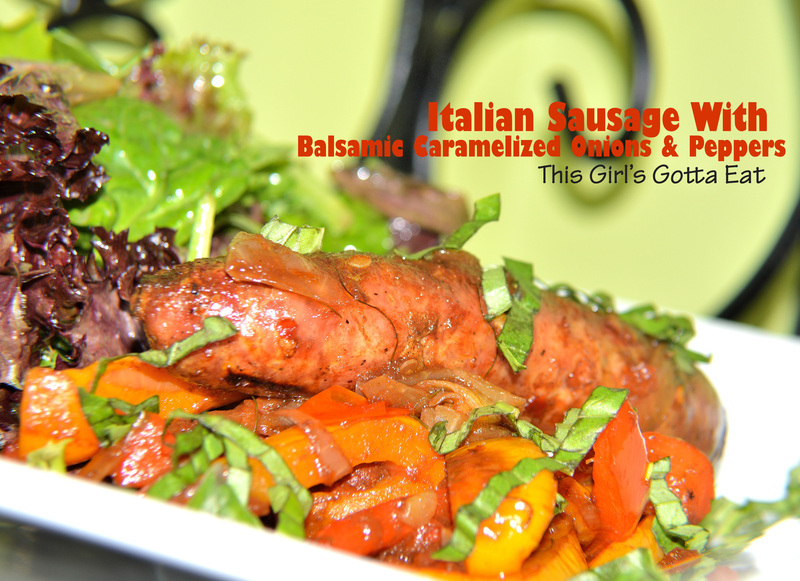 I highly recommend dining alfresco with this delicious Italian meal! Set up a little bistro on your porch or patio, pour yourself a glass of vino and mangia! There’s just something about fresh pasta! This savory Ohio City Pasta linguine was compliments of our Fresh Fork Market share, along with some beautifully big tomatoes! Fresh tomatoes cooked down and finished with a little cream is delicious. 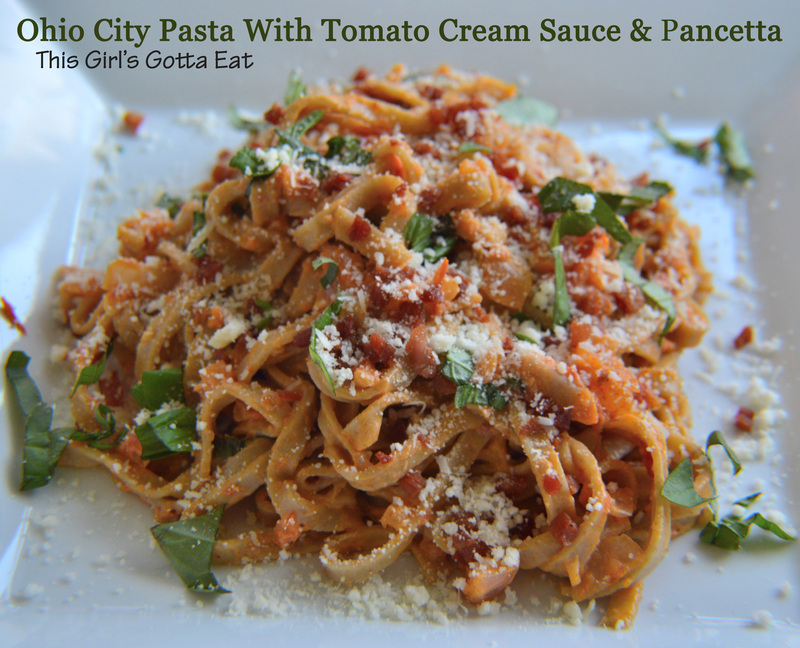 But top it with crispy pancetta, fresh basil and cheese….and you’ve got yourself one decadent meal! Heat a large skillet over medium and add a drizzle of olive oil. Add pancetta and saute until browned and crisp, 3-5 minutes. Remove the pancetta to a paper-towel lined plate. Add onion to the hot skillet and saute a few minutes until beginning to soften, stirring often. Add garlic and red pepper flakes and saute until fragrant, a minute. Season lightly with salt. Meanwhile, puree the tomatoes in a Vitamix or blender. Add to the skillet with the sautéed onions and cook until liquid is almost all evaporated, stirring occasionally. Season with salt and pepper to taste. Add half-and-half during the last few minutes of cooking, and stir to combine. At this point, cook your pasta in the boiling water. Don’t over-cook it! Because it’s fresh it’ll be done in 1 and a half to two minutes. Drain, and immediately add to the skillet with the sauce. Toss with the sauce over low heat for a minute, allowing the pasta to absorb the sauce. This is a unique, and tasty appetizer that I’m sure you won’t see at many parties! It’s perfect for summer picnics or potlucks because you serve it room temperature. 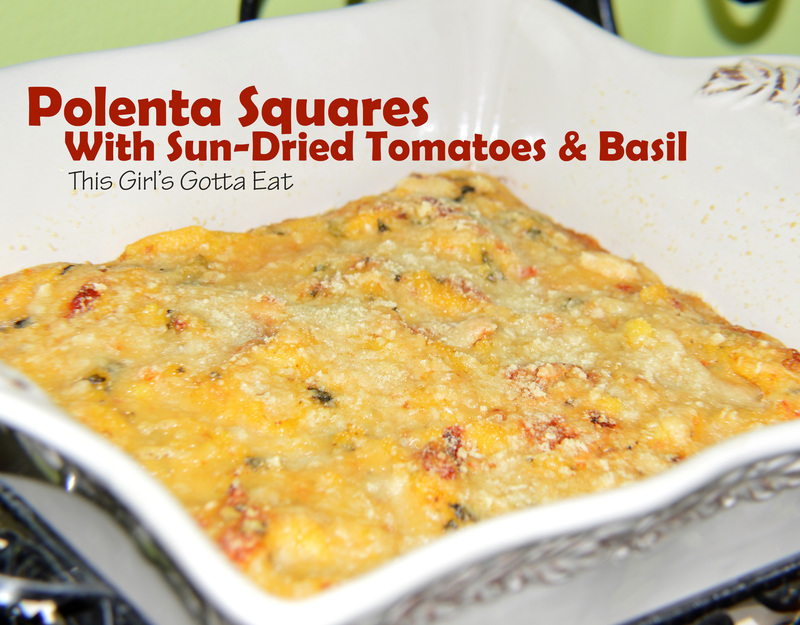 You could also serve these polenta squares as a side dish, making this versatile too. Bring water to a boil in a large sauce pot over high heat. Add salt. Slowly add the cornmeal and whisk constantly. When the mixture boils (which will happen quickly and be careful, the mixture will be hot), reduce the heat to low and continue stirring (with a wooden spoon) until very thick, about 30 minutes. 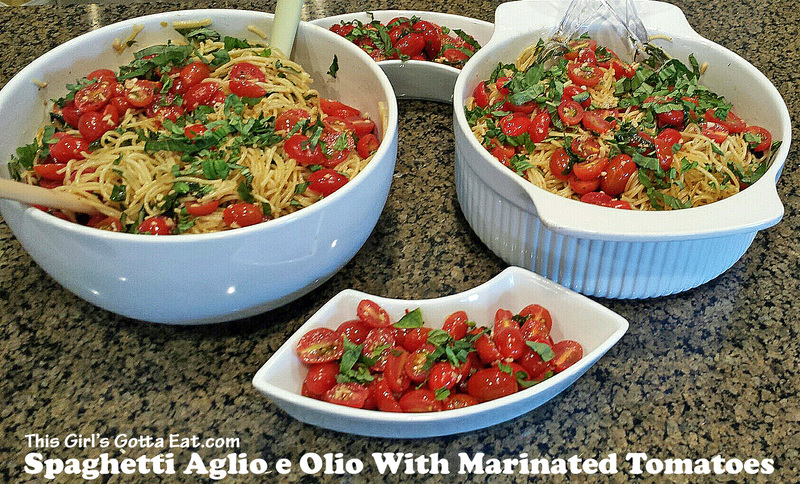 Add the sun-dried tomatoes and basil and stir well. Pour the polenta into a square 2.5 quart casserole dish sprayed with non-stick spray, making sure to spread evenly. Chill in the fridge until firm. Sprinkle the top with parmesan cheese and bake for 20-30 minutes until lightly browned. Cool to room temperature and cut into squares. You can get more squares if you go for smaller, bite-size pieces. You can make this a day or two ahead of time and store covered in the fridge. Just bring to room temperature before serving. This technique of grilling fish on top of lemon slices is brilliant, and is my new favorite way of cooking fish! The citrus helps flavor the fish, but more importantly it prevents it from sticking to the grill. Flavorful, smoky fish that’s done fast – that’s my kind of summer supper! Preheat grill to low heat. You don’t have to use a grill pan if you don’t have one, I just thought it was easier for transporting these stacks. Spray the grill pan with non-stick spray. Each piece of fish will use 3 thick slices of lemon. 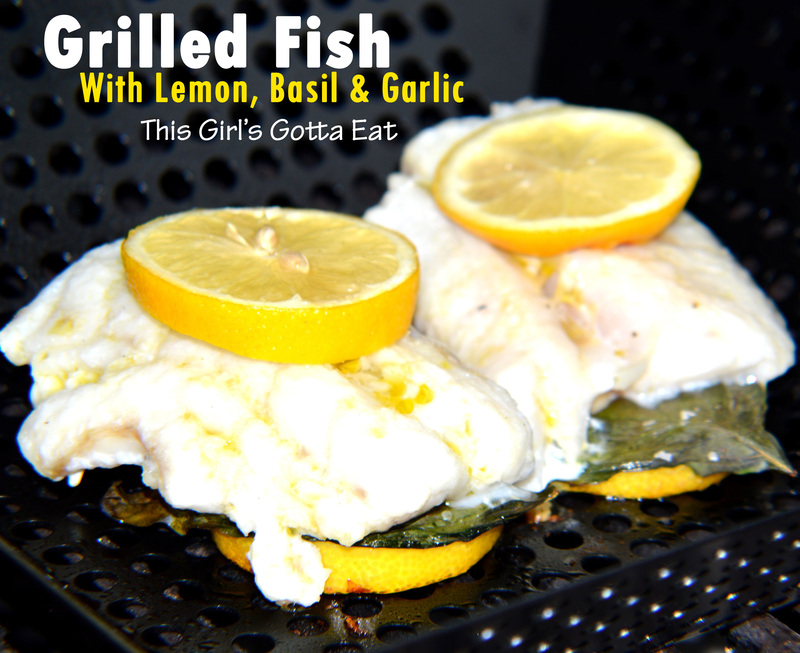 Place 2 slices of lemon per fish on the grill pan and top the lemon with a layer of basil leaves, using however many you need to cover the lemon slices. Next, add 2-3 smashed garlic cloves on top of the basil. Top the lemon, basil and garlic with a piece of fish. Drizzle the fish with a little olive oil. Season lightly with salt to taste, and top each piece of fish with another slice of lemon. Grill covered for about 10-12 minutes (do not turn), or until fish has turned opaque and begins to flake. Serve with more lemon slices and roasted or steamed veggies. Bring a large pot of salted water to a boil. Add cut asparagus and boil for 2-3 minutes until bright green and crisp. Remove immediately and run until cold water to stop the cooking process. Set aside. Bring the water you used to blanch the asparagus back to a boil. Heads up, the water will be green from the asparagus, but no worries – that just adds flavor! Meanwhile, in a large skillet over medium-high heat, warm a few Tbsp of oil and add prosciutto. Cook, stirring often, until golden brown and crisp. Remove prosciutto to a paper towel-lined plate. Lower heat to medium and add 1/4 cup of extra-virgin olive oil. Once the oil is hot, add the shallots and cook for 2 minutes, stirring constantly. Next add the garlic and red pepper flakes, cooking for another minute to flavor the oil. Turn the heat down to low and season lightly with salt to taste. Add the butter, and swirl to melt – this will also help thicken the sauce slightly. Add the gnocchi to the boiling water, cover and bring up to a rapid boil. Once the gnocchi float to the top, they’re done (this will only take a few minuets, they cook fast). If using store-bought gnocchi, be sure to follow the cooking instructions on the package instead. Remove with a slotted spoon or spider strainer and add right to the sauce. 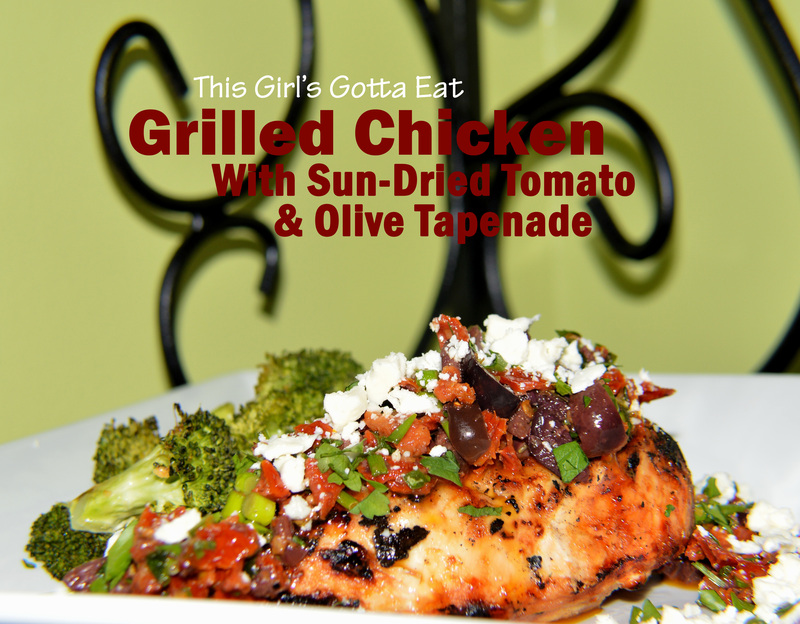 Don’t worry about some of the cooking water getting into the sauce, you want that! Once all the gnocchi are in with the sauce, add the cooked asparagus to the sauce as well. Add half the basil, increase heat to medium and cook everything together, stirring constantly for a minute or two. Taste and season with a little more salt if needed. 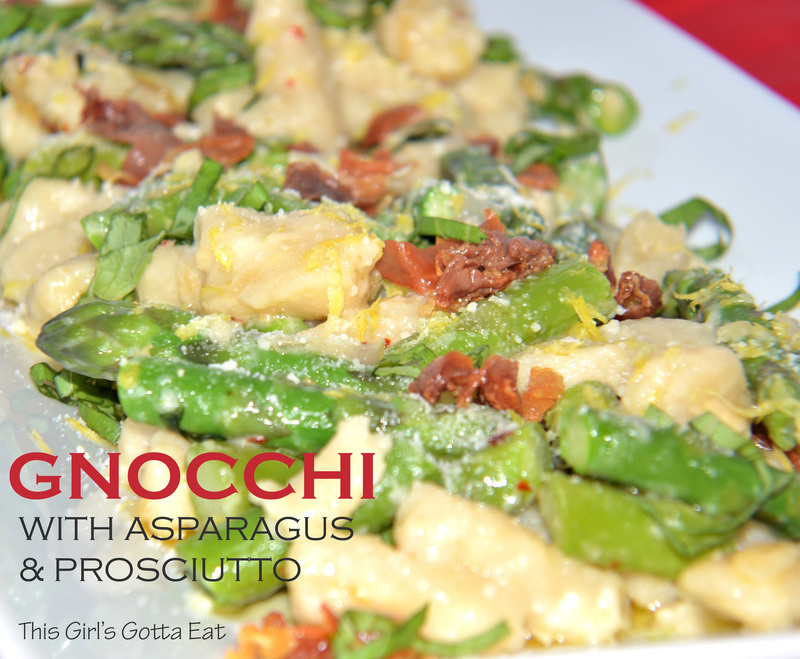 Transfer gnocchi, asparagus and all of the sauce to a large serving platter. Garnish with the crisp prosciutto, the rest of the basil, fresh lemon zest and as much parmesean as you like. Serve family style, with more parmesean on the side. My choice of wine with this dish: Chardonnay.